As the day progresses, Deborah grows covered with hives, and Rebecca becomes concerned. The two finally get to Clover, where Deborah asks Rebecca to take a photo of her with the two pictures of Elsie in front of Henrietta’s grave. They then go to visit the elderly Gladys’s house, where Deborah announces that she is going to start a Henrietta museum. This moment and photo are filled with pathos in the narrative—for the first and only time, the Lacks women are together. This shows how lonely Deborah is, and how intensely she longs for the relatives whom she’ll never know. Gladys’s son Gary comes in, and Deborah shows him the new picture of Elsie. He and Rebecca are both worried about the over-emotional Deborah, who’s still covered in hives. Deborah grows increasingly hysterical as Gary tries to calm her, telling her that she must “relax” and quoting scripture. Gary eventually begins channeling the holy spirit, praying and singing to God for Deborah, and begging that the “burden” of Henrietta’s cells be lifted from her daughter’s shoulders. Deborah sobs, and Rebecca feels incredibly guilty for the grief she believes she has caused. Gary, however, thanks God for sending Rebecca to them and prays for Him to give the burden of the cells to her. We return to the theme of spirituality, an uncomfortable topic for Skloot, but an immensely comforting one for the Lackses. By thanking God for Rebecca, Gary generously includes her in this family tradition, while also highlighting one of the deepest themes of the book—the way in which Skloot has taken on the “burden” of Henrietta’s cells and story as her own, or least has offered some relief for the Lacks family. Hoyt-Disick, Gabrielle. "The Immortal Life of Henrietta Lacks Chapter 35: Soul Cleansing." LitCharts. LitCharts LLC, 29 Jun 2016. Web. 23 Apr 2019. Hoyt-Disick, Gabrielle. "The Immortal Life of Henrietta Lacks Chapter 35: Soul Cleansing." LitCharts LLC, June 29, 2016. 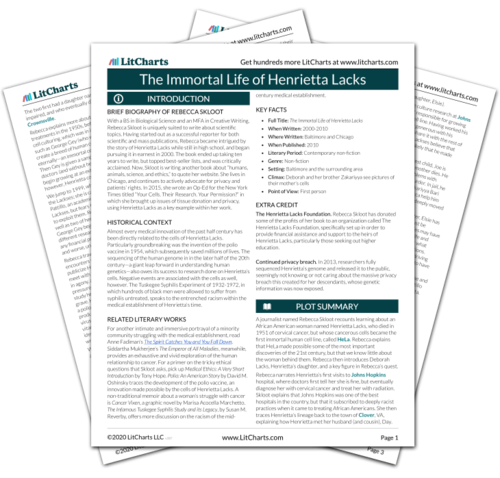 Retrieved April 23, 2019. https://www.litcharts.com/lit/the-immortal-life-of-henrietta-lacks/chapter-35-soul-cleansing.